Colorado state capitol in Denver. 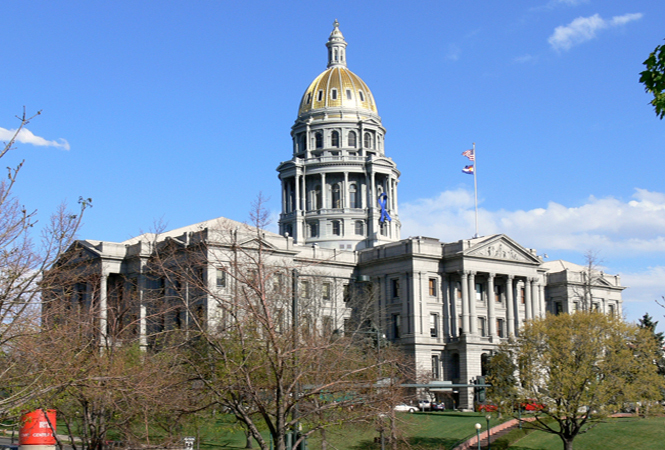 DENVER — Colorado mental health professionals would be barred from practicing gay conversion therapy with minors under a bill given initial approval Friday by the state House. The sponsor of the bill, Democratic Rep. Paul Rosenthal, an openly gay lawmaker from Denver, said the goal is for therapists to help youth pursue acceptance and support for who they are. “Helping the youth explore their identity — who they are, not who the therapist thinks they are or who the therapist thinks they should be,” he said. The House advanced the bill on an unrecorded voice vote. A final vote this week could send the proposal to the more conservative Senate, where its chances were less clear. The measure would forbid therapists from trying to change the sexual orientation or gender identity of a person under 18. Therapists who do not follow the rule would face disciplinary action from their licensing board. Republicans worry that therapists could be punished for merely being perceived as trying to change someone’s sexual orientation. Rep. Brian DelGrosso, the Republican House leader, said he’s concerned about unintended consequences. He asked what would happen in situations when a youth is confused about sexual orientation. “What I’m worried about is if that line is kind of blurred, that me as the counselor, I would be scared to ever go down that road and have that conversation,” DelGrosso said. Rosenthal said he’s simply trying to align state licensing standards to medical standards that have long dispelled homosexuality as being a mental illness. New Jersey, California and the District of Columbia all have passed legislation banning gay conversion therapy for minors.